I’m not so sure that downsizing is taking the country by storm, but an interesting article in the New York Times highlights a few folks who have taken downsizing to the extreme. A man who built an 80-square-foot tiny house out of free stuff he compiled off of Craigslist is included in the article along with a woman who lives in an 84-square-foot home that is in her friend’s back yard. While my wife and I decided to downsize our home this past year, cutting our living space by one-third, our decision was quite conventional compared to these tiny homes highlighted in the article. I’ve seen children’s playhouses that were larger than some of the homes pictured. I’m not so sure that these tiny homes are trendsetters, but they are definitely unique while being a repudiation of the “bigger is better” mindset when it comes to most home construction. These tiny homes may be an option for empty nesters or singles who want to buy a starter home, but raising a family may be a bit too much for such little space. If I were single, and had the $$ to sink into it… I’d be awfully tempted to try it out. I like the Tumbleweed houses– especially the Weebee– but my favorite small house ever is the 16×28 Victoria’s cottage: http://www.countryplans.com/victoria.html . I think the reason I find them so appealing is that it makes Morris’ “beautiful or useful” maxim a necessity. Especially in something like the Weebee, there’s no room at all for things you won’t use, and since everything’s _right there_, you want it to be something you’re going to like looking at…. My husband and I have been dreaming for a while of building a house with our own two hands, and the problem of where to stay while we’re building has come up a few times: it’ll be too long a time to stay in a tent, we don’t want a trailer, we were thinking of building a garage first and sleeping there… but this is the perfect solution: we could build something like this pretty fast out of salvaged stuff, stay in it while our house is in the works, and then keep it as an office/guest space. And it’s such a relief that small houses are in the news. Maybe as a society we’re finally starting to move away from the ideal of ugly monster McMansions. Wow, I have soo much interest in these little dwellings. I’d really like one (preferably ~250sq unit), but I don’t know if it would have much resale value. I guess you can have it “shipped” if needed. Also, it would look pretty odd in a neighborhood and would be prone to pranks. These would be great if you put them together to make a little neighborhood, 2-flat, 3-flat, or 4-flat. regarding a “normal looking front face” – I mean a house that *horizontally” fills an acceptable (i.e. non-odd looking) amount of the property. Great NYT article and here’s a hearty second on down-sizing. My husband and I just moved to a house that’s a third smaller than our last one and we’re loving it. It took a bit of time to choose what of our stuff we were going to let go — and we’re not big hoarders to begin with — but the freedom from stuff, the freedom of less housekeeping (it was a noticeable difference), and the freedom of a lighter footprint in the world feels fabulous. I was interested to read in the NYT article that the movement involves “living in spaces that are smaller than 1,000 square feet and, in some cases, smaller than 100”. I just dug out the agent’s details of my 2-bed cottage – one that is considered ‘a good size’ here in the UK and is certainly bigger than modern 2-bed houses – and did the maths. It’s 800 square feet. (Bear in mind in the UK that we tend to think in type of house/number of rooms, not square footage, hence needing to do the maths.) Never before have I realised the disparity between the UK and the US’s definition of ‘a small house’! From a minimalist perspective, these sub-100 square foot homes, and the people who live in them, are INSPIRING!! Thanks for the post. This small living thing is interesting. I grew up living half the year in a Holiday Rambler. Anyone else remember these travel trailers that slept 4 people? My family of 4 lived in it from April to November every year from the time I was 3 until I was in middle school, when we upgraded to a Park Home (think small mobile home). Found a photo of one very similar to ours here: http://grandfatherslegacy.com/images/070926036.jpg Now how different is that type of living from these new construction homes? There are some great examples of compact homes built using 40 foot shipping containers, on Treehugger.com. These are extremely sturdy, eco-friendly and not very expensive since there is an overabundance of shipping containers that end-up on US shores. I came across these types of tiny houses after Hurricane Katrina. Articles and discussions on temporary, small footprint, but comfortable housing (in lieu of FEMA trailers) known as “Katrina Cottages” often, led me to the Tumbleweed homes and others. I LOVE the idea. Don’t know if I’d be able to live it full time, though. I live in a small house, about 600 square feet for my family of five. We first moved in as a young married couple, and then started having babies. We always said to ourselves “Well, we’ll be able to have one baby here.” And then it was “If we organized it like this, we could put a crib here” and eventually we thought “Well, why not have a third? Babies don’t take up very much room anyway.”. They don’t but that’s a separate post. It’s been six and a half years, and I love my little house! I have no desire to move. One of my favorite blogs, DinosaursAndRobots.com, has run a number of posts about little houses and has coined the term ‘shackitecture‘ to describe them. My favorite shack is this one. I think it’s perfect. My husband and I are getting ready to break ground on our own tiny house (hopefully in the next couple of weeks). Tumbleweed houses ARE cute, but shelling out $20k+ for a tiny house seems a little ridiculous when you can build one for MUCH less! Ours comes out to just over 200 sq. ft. (for 2 people and 2 pit bulls! )and we know it’s totally doable for us because A) we don’t mind spending time together in close quarters (we prefer it actually) B) we have a lot of outdoor space to “live” in and C) knowing that we built it ourselves without going into debt—priceless. It’s exciting to see the trend picking up steam! I vaguely remember a photo of a broker in London whose arms spanned the width of a flat he was selling. If I’m not mistaken, it was ~50 square feet — and didn’t have a bathroom. Here in NYC, there are always people living in small areas. IKEA Brooklyn even dedicates considerable space to showing how people can live easily in under 300 square feet — with a bit of ingenuity and stacking of course. I’ve written about this here in fact — there was a family of 3 (two parents and a young child) living in such a space. You have to keep things down to necessities for the most part, and everything you keep should be in a designated spot. That display at Ikea saved me…my university-owned apt is 362 square feet. It’s perfectly doable, but clunky university furniture and radiators do take up more space than you realize. I think I’ll move into my closet and rent out the rest of the house. I forgot that my first apartment had a nice walk in closet in an other wise very small space. The owner told me that the last guy had sublet the closet to a friend who used it as a bedroom. Also a post about Pre-fab and Modular Housing which is another interesting housing solution. Moving from Canada to Spain really changed my mindset on the size of house needed. In Toronto I owned what most people considered a very small home (just under 1000sq ft) and I often thought it was small for two people (although when it was built a family of 7 lived in 2/3 of the space). In San Sebastian, Spain (one of the country’s most expensive cities), my boyfriend grew up with 5 in his family in a space smaller than my house and there were other families that had 7 kids in the same space! I now live in an apartment of 250sq ft with my boyfriend and other than wanting to completely redo the kitchen and get a new wardrobe (neither of which will happen since we’re renting), I’m totally happy with the space. We’re in the (slow) process of converting a brick building–originally a large garage/garden shed–in our backyard into a cottage. It’s about the size of one of these smallish houses. Our intention is to make it into a ‘survival cottage’–a place off the grid where we can live during power outages. My husband likes the idea of, when the kids are all grown, living in the cottage and letting one of the kids–whichever one is married first–have the big house. I like it. Having a smaller dwelling to care for in our old age sounds very appealing. I’m *very* interested to understand where people live – for those that are *living* in very small houses (less than ~600sq.ft.). So…where do you live? I love the tiny house idea so much, but I haven’t figured out how to do it where I livel or will likely live in the future due to my career direction. @Will – that’s an awesome website/blog! Plenty of extra-small living spaces all over the country–called mobile homes. Seriously, I’ve lived in a pickup truck camper, equipped with a Coleman stove, laptop and printer, and 2-gallon mayo jug privy. Owned two homes of fewer than 1000 sf, with a husband, and a 1700 sf, solo. Found a pull-behind camper leaky and unliveable. I’d love a well-designed solar house of 500 sf or so. 80 sf is only practical for loft bedrooms and those folks who never, ever get up in the middle of the night to stumble and trip over their own feet in search of a bathroom. God/dess forbid I should have to take a chamber pot down a loft ladder! They also pay far less for heat and electricity because when they built their home they were smart and instead of dropping $26,000 in kitchen luxuries, they used it to put in skylights and better windows, insulation and HVAC equipment. now in the daytime no light has to be ever turned on in any room, and they pay $100.00 a year for AC and heating costs here in michigan. Yes that is per year. I find that far smarter than cultured marble counters and a subzero freezer. I’m jealous of them, they have lots of free time because the house does not own them, and their home is far more cosy and inviting than any 2800-4800sq foot home I have ever been in. The ultra-small ones are too claustrophobic for me, especially the sleeping loft. 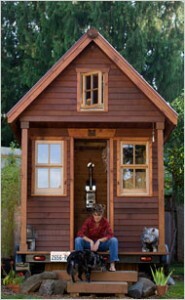 After living in a series of very cluttered homes for 21 years, I love the tiny house concept! I have been known to obsessively browse the tumbleweed website. I would even be willing to limit my book collection (I am an English major) in order to do it. If there was anyway I could afford to build a house at this point in my life, it wouldn’t be an inch over 200 sq. ft. I saw an article on CNN about housing that is not this extreme, but is a modest 320 sq ft each – shipping containers! This is an ultimate form of recycling because these sturdy weather-resistant steel containers would otherwise get scrapped.